Earn up to 2,240 reward points. Easy to install and produces professional results. 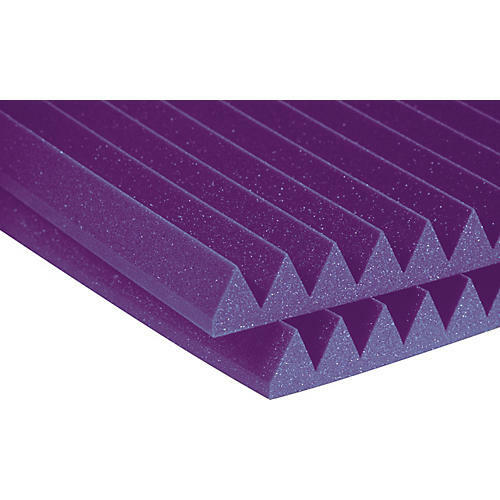 The 2" Studiofoam Wedges are Auralex's most popular seller as extremely effective sound absorbers. Use these wedges to sound proof small - to medium-sized areas including vocal booths, control rooms and sound studios. The Auralex sound proofing material effectively kills standing waves and flutter echoes and, when used in conjunction with the Auralex LENRD or Venus Bass Traps or our Sunburst Broadband Absorbers, can effectively tame the full frequency bandwidth in virtually any room. 2" acoustic Studiofoam is quite simply the workhorse of the music industry and is your safest bet if you're tuning your room yourself without the help of a professional acoustician. For installation, Studiofoam Wedges require Auralex Foamtak spray adhesive (sold separately, - see #422605), which allows you to remove the foam later. For more permanent installation use Tubetak (sold separately - see #422606) or Tubetak Pro liquid adhesive applicators (sold separately - see #472436). 1 Foamtak covers up to 96 square feet. 1 Tubetak/Tubetak Pro covers up to 24 square feet.